Posted by Lacey Hagler on Friday, September 7th, 2018 at 10:39am. The Florida Atlantic University football team is chalking up last week’s loss in Oklahoma as a learning experience, and fans are flocking to the FAU Stadium in Boca Raton tomorrow for the first home game of the season. Head coach Lane Kiffin has announced the team will be wearing all red, and asks that fans do the same. The hometown heroes will be playing Air Force, and it will be the first meeting between the two teams. If the Owls win this game, it would be the program’s 88th win, and it will extend FAU’s home win streak to eight. The first FAU football home game of the 2018 season is Saturday, September 8th at 2:00 pm at FAU stadium in Boca Raton versus Air Force. It will be aired live on FOX Television, as well as on ESPN West Palm 106.3 FM Radio. You can also stream it online via TuneIn. Florida Atlantic University is conveniently located in Boca Raton Florida east of I-95 between Spanish River Boulevard and Glades Road. 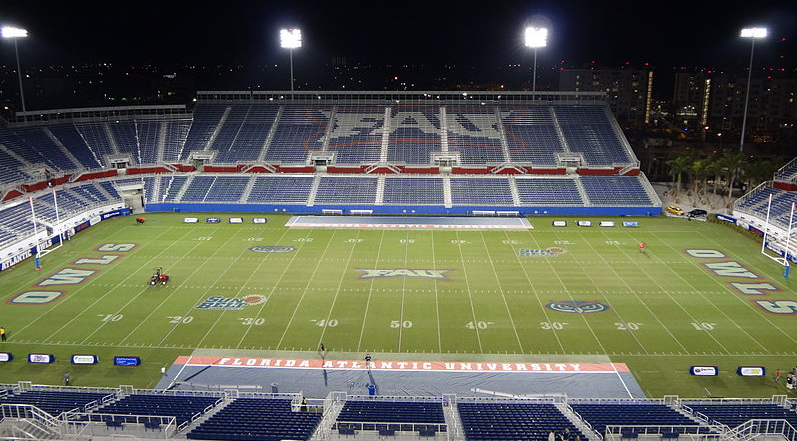 The FAU Stadium address is at 777 Glades Road in Boca Raton. To purchase season tickets, call 1-866-FAU-OWLS.